With medication management playing an increasingly pivotal role in the treatment of mental health disorders, the challenges faced by clinicians are increasing. For one, non-medical clinicians provide the majority of mental health services in the United States. For another, the majority of prescriptions and orders for psychotropic medications are written not by psychiatrists, but by family practice and primary care physicians. As a result, you may be working with patients who are neither in a program of monitored drug use nor being treated with a combination of medication and psychotherapy. How the depression presents. There are several subtypes of major depressive disorder, but none of them are reliable predictors of antidepressant response. Nevertheless, there needs to be a starting point for the selection process. For example, is the client’s depression accompanied by anxiety and insomnia, or is it characterized by melancholia, hypersomnia and a vegetative state. In the first example, any of the SSRIs with the likely exception of Prozac (fluoxetine) because of its energizing properties, would be acceptable choices; the latter example would be better served by Prozac (fluoxetine), the SNRIs Effexor (venlafaxine), Cymbalta (duloxetine), Pristiq (desvenlafaxine) etc. or Wellbutrin (bupropion). Personal and family history. Has the client had any previous experience with an antidepressant? If yes, what were the results? If the medication was discontinued, why? If it worked, try it again, unless the client’s clinical condition has changed enough to no longer warrant its use. Does the client’s history include a family member who was prescribed an antidepressant drug and responded to it favorably? If so, use this possible DNA phenomenon to the client’s advantage by using the same medication. Drug characteristics. Prozac (fluoxetine) and Wellbutrin (bupropion) are examples of “energizing” antidepressants; whereas Paxil (paroxetine) and Celexa (citalopram) tend to be more sedating. Initial choices therefore, should be predicated on how the depression presents—as outlined in #2 above. The point here is that one size does not fit all, and selection should not be based on what samples are in abundant supply or what pharmaceutical representative just visited. Reasonable expectations. When anyone is started on an antidepressant, the individual should be informed as to what to expect from the drug. Inform them that antidepressants may take several weeks to generate any consistently noticeable mood improvement. They should be counseled to take the medication as prescribed for a defined period of time—say six months—before a reassessment. Let the client choose. Initial antidepressant selection is solely within the prescriber’s domain, right? Not so fast. No one antidepressant or antidepressant class consistently outperforms another. So let the client choose his or her antidepressant based on acceptable side effects. By acceptable side effects, I mean those that the client is willing to put up with or tolerate. Prepare your client for an antidepressant trial by first focusing on the drug’s side effects — not therapeutic effects. Then have them share their selections with the prescriber, where they are not likely to get much pushback — unless there are threatening contraindications. Proceeding in this manner helps the client put side effects in perspective, which in turn tends to mitigate the annoyance of having to endure them in the first place. Also, getting the client involved in the selection process has them believing they have “skin in the game” when it comes to what they will be taking. The result: exercisable choices fuel empowerment and empowerment fuels compliance. That’s win-win. Finally, finding the right antidepressant fit can be tedious. Users should enlist the support of trusted family, friends and maybe even colleagues for encouragement as needed. If you are looking to gain confidence in your role as both the patient advocate and protector to effectively address medication assisted treatments in your overall care plan, then 2018 Psychopharmacology Intensive Online Course: Everything the non-prescriber needs to know is for you. Designed for counselors, nurses, psychotherapists, psychologists and other mental health professionals, this comprehensive online course will walk you step-by-step through the science of psychopharmacology in a non-threatening, non-complicated way. You will learn the newest advances and contemporary trends in blending medication management with psychotherapy interventions for ADHD, depression, anxiety, psychotic disorders, substance abuse and more. Don't wait to get the knowledge you need to know to answer your clients' questions, manage side effects, understand medication reactions and improve your treatment outcomes. Register Today! Joseph Wegmann, R.Ph., LCSW, is a licensed clinical pharmacist and a clinical social worker with more than thirty years of experience in the field of psychopharmacology. 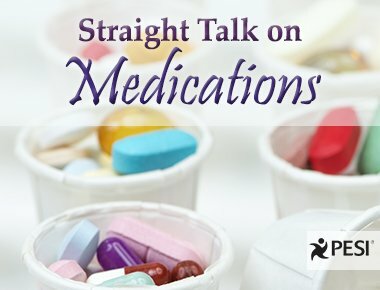 His diverse professional background in psychopharmacology and counseling affords him a unique perspective on medication management issues. In addition to consulting with numerous psychiatric facilities, he has presented psychopharmacology seminars to thousands of clinicians in 46 states. Joe has also served as a Clinical Director of Pharmacy Services at a major metropolitan area hospital and as a Regional Director of Hospital Services for Premier Healthcare Corporation. He has served as Adjunct Professor of Psychopharmacology in the graduate School of Social Work at Southern University of New Orleans for 16 years and maintains an active psychotherapy practice specializing in the treatment of depression and anxiety.